What would you say about yourself with 5 sentences? 1. I am the girl you can see with her e-book reader at the cafe or in the bus – I just love to read, especially autobiographies and dystopian books. 2. I am the girl you can see at the gym after work and on her rollerskates during weekends – I just love sports. 3. I am the girl who could die for Blair Waldorf’s wardrobe – I just love her style. 4. I am the girl who loves to dream – one day I will come upon a really great idea that would change the world. 5. I am the girl you can see using Linux on her personal computer and Android on her mobile phone – I just like Tux (the penguin, you know). I think it was something I just stumbled upon and luckily I’ve never had to regret it. After graduating from high school there was this horrible period when everybody expected to know what I would do with my life, what I would study next. And I had no idea whatsoever! All I knew was that I liked science more than arts. I then chose three totally different subject fields to apply for and waited, hoping that admission would narrow down my options… and when it didn’t happen, I trusted my gut feeling and just made a lucky pick. IT here I come! University was hard at first because unlike many of my fellow students I had never had any computer classes and I came from a school that emphasized the importance of languages, history and culture. Sometimes I really felt others had a huge advantage because they already had all the basic knowledge and I had to start from zero but after the first year everything magically became easier. Later It really did not matter what school one came from and you could blame or congratulate only yourself for all the achievements. Now as a programmer I enjoy what I do. I am like Dr. House – I like puzzles. I like to work hard on a problem and then enjoy the rewarding feeling when I have solved the problem and made something important. I realize that all the hardship in the beginning was because of my own choices but I have never for a second regretted the path I have chosen for myself. Some would say that my life is boring at the moment because there are no huge projects nor am I studying something at school but I quite like it for a change. Balancing full time job and Master’s studies with personal life was somewhat challenging and I take current period as a well earned vacation which I realise cannot last forever. One needs challenges to spice up their life! At the moment I just do my day-to-day assignments – make improvements to existing bank systems so that they would be easier and more efficient for cashiers and administrators to use. After work I have some mostly technology-free me-time that I fully enjoy. People lived successfully during the stone age, so I could probably manage without apps. But with all the possibilities out there, four apps I use the most are calendar, mail, alarm clock and some kind of weather app. What is the most memorable situation you have ever been in concerning technology? When I was younger I got my mobile phone stolen. Two years in a row at the exact same date. Coincidence? After years of use my old laptop broke down. Its USB 2.0 started working as USB 1.0, plastic parts just kept falling off and finally touchpad died. I tried to change the touchpad (because of that the laptop was taken apart a couple of times and since every time it turned out the “new” touchpad did not fit, it was again reassembled). The touchpad was still dead. I then gave the laptop to my parents to use with a mouse as a desktop computer and after a couple of months I got a phone call from them saying that the touchpad had spontaneously come to life. Maybe it just did not like me as its user anymore? What was the last interesting technology event you attended/participated? There have been a couple of trainings/events during past year but none of them has stood out enough to mention here. 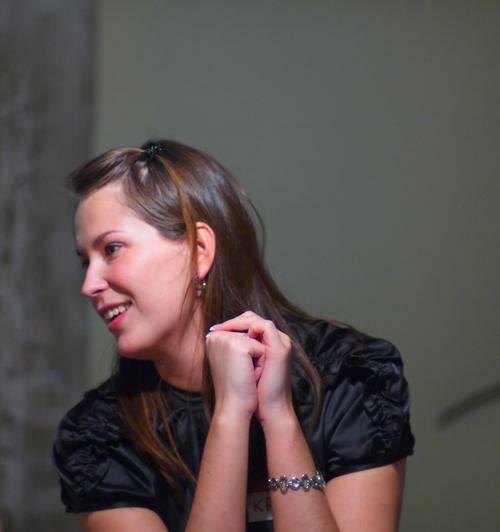 The last really interesting technology event was Rails Girls Tallinn in 2012. I enjoyed its friendly informal atmosphere and was in awe of all the enthusiastic women there who were eager to learn something new. Does our current education system support female techmakers? I am not one of those who believe we have a huge problem with discrimination against women. If a young person wants to enter the technology world, the gender really does not matter. We could ask whether our education system supports techmakers in general but that would be a totally different subject in which I do not feel competent enough to take a stand. I think that the opportunities vary greatly depending on the specific school curricula but that is not the question of our education system rather than young persons’ (or parents’) preferences while choosing the high school. If you could make a video/computer game, what would it be about? It would be something strategic and true to life. Something that in the end would make you feel like you had achieved something or done something great.